Here is a simple box that can be used as a gift box or as a safe place to store small treasures. The lid is detachable and you can even adjust the size of the box if you desire. Make this a special box by adding appliqués! Just follow the crochet instructions below to create your very own box! Note: the decreases are made in each of the four corner. If you altered the size of the square, you must shift the decreases in round 8. Note: the decreases are made in each of the four corner. If you altered the size of the square, you must shift the decreases in round 9. 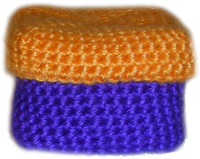 If you need help crocheting this box, let me know by leaving a comment and I would be glad to help! This entry was posted on Tuesday, April 28th, 2009 at 6:45 PM by Rachel Choi	and is filed under Free Crochet Patterns. You can follow any responses to this entry through the RSS 2.0 feed. You can leave a response, or trackback from your own site. Love this one Rachel! Thanks so much! I am going to make one soon to store my little bits and bobs! Looks so cute, cant wait to make one! This is a great idea, and sooo cute. You could even add some wee eyes and a smiley face. I just used acrylic, nothing special. If you have any of that cheap red heart yarn, it’s really stiff stuff. It’s the small hook that should make the stitches tight so that it won’t be so floppy. But of course it won’t be stiff like a cardboard box. thanks :] i was gonna use red heart at first, but i would of had to get up to get it, and cotton was on my bedside table. hahaha. Very cute. Where do you get these ideas from? they are awesome!!!!!!!! sooo cute…is it work in round?or joining every round with slipstitch? Evi, it’s worked in the round. There are no slip stitches for joining. Just follow the instructions as it’s written. Thank you for posting up this lovely pattern! Can I change SC to HDC for the few last top rounds? As this pattern is crocheted in spiral way, how do I change SC to HDC? Do I need to ch 2 first and sl st at the last st of that round? Hope you are able to understand what I’m trying to say…sorry for my poor English. Thanks! Cherine, you can replace the sc with hdc. You can work hdc in a spiral as well, without the ch 2 and sl st. But you can do the ch-2 and sl st if you desire. Do you mean that I can change to HDC even if I started with SC for the 1st few rounds(halfway of the project), in a spiral way? or I must crochet the whole project either only with SC or HDC? Cherine, you can replace the sc in rounds 9 – 20 with hdc. You can do it the spiral way or not spiral way, your choice. Let me know if you need more help. Thanks, Rachel, will definitely try this out! God bless. Hi there, thanks so much for the pattern. I have been looking for a square in the round for soooooo long. My issue is how can I make the basket look more square at the top. The basket is square at the base but because of the “in the round” spiral it winds up looking round. I have shaped it but still, I hope you know what I mean. Is there a stitch that I could use in the corners to sharpen up the corners as I go up the edges? Thanks very much. pat. Hi, thanks for getting back to me so soon. Well, I am not sure that there is more that I can do, other than shaping the piece dry. I am using regular red heart acrylic yarn and I know water doesn’t really do much. I guess I will have to show the people I give my baskets to how to “block” or shape the square baskets. Thanks again. Patricia. instead of sc,can i do dc instead? Hi Sofea, if you use dc, the bottom of the box may not lay flat since the dc stitches are longer than sc stitches. I wouldn’t recommend using dc, but you can play around with it if you’d like. Not at the moment Ghislaine. Perhaps I can try to work on some for future patterns. Can you explain the decrease to me. I think I’m missing something. Hi Beth, here’s the tutorial for decreasing with single crochet stitches: How to Crochet: Single Crochet Decrease Let me know if you need more help. I would also like to know how to change SC to HDC. Normally there would be a “ch 2 and sl st” at the end of the sc round, but working in a spiral I don’t know how to do it! Please help! Tks in advance. hi! i need some help. this is my first time making a box, and when i finished the 20th row of the box, it’s clear that the last stitch (and round) is higher than the one before. does that make any sense? i’m supposed to finish off after the last stitch, but it clearly looks higher than the first stitch of the previous round, which is right next to it. what did i do wrong? is there any way to fix this? thanks so much. Hi Juliet, it is suppose to be like that. To finish off, you can make a slip stitch into the next stitch and it should even it out. If you want a round based box, how do you transition from base to side? I guess a hexagonal based one would have 6 instead of 4 sc in the first round? but the transition would be the same as the square box? Yes, you have the right idea Asprin. Here’s a tutorial on making the circle for the bottom if you need it: How to Crochet a Circle. I just completed my first box and I just love this pattern. I also plan to use the spiral square concept to make myself some coasters. Thanks for the great pattern! Hi I’m doing this for a school assignment. Can you explain what you mean by decrease, sc in next 11 sc? After you do the decrease, you’ll do one single crochet into each of the next 11 single crochet stitches. Am making a bigger box for the cabinet using a rayon cord. After 15 rounds working on the sides, it seemed like the higher it becomes, the bigger it looked. Shall i do another round of decreases at each corner? Sure, you can do some decreasing rounds. Also try to double check your stitch count to make sure you aren’t accidentally adding stitches. How would this work using either ‘plarn’ or t-shirt yarn?? Hello! You will make 1 decrease in each of the 4 corners. So you can single crochet across until you get to the corner, then make the decrease. This looks like an oldie but let me tell you it’s a goodie. I was looked for a box pattern and yours was so simple to follow and the fact that I can make it any size I want is definitely a plus. I used bulky yarn and a “G” hook so it is good and stiff. I needed it to last a long time. It is for a little girl whom just lost her dad unexpectedly so it will be her “Daddy Box” to keep her special things from and about her dad. Thank you so much for a great pattern.